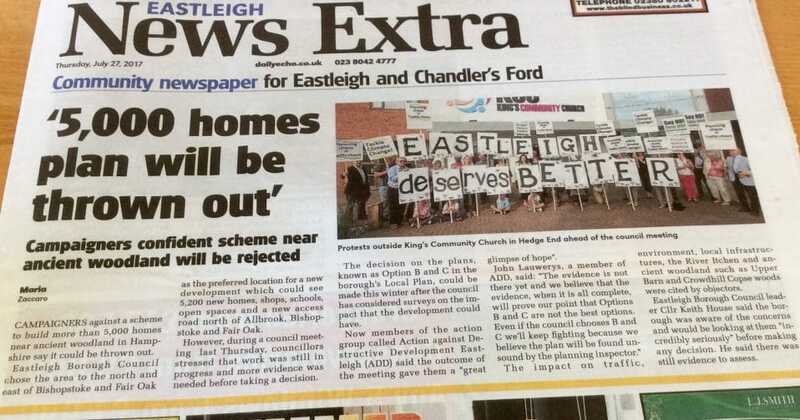 ADD UPDATE, 2 August 2017: Draft minutes from Eastleigh Borough Council (EBC)’s crucial meeting on its emerging Local Plan on 20 July, at which a clear preference was voiced for options B and C (namely the plan for 5,200 new houses and a major new road north of Bishopstoke and Fair Oak), are now available on the council’s website. These minutes include a record of which councillors voted for, against or abstained in the vote to “note the emerging approach” on the Local Plan. Two Liberal Democrat councillors declared pecuniary interest, one of whom was Fair Oak’s Nicholas Couldrey, and neither took part in the debate or vote. Voting against were Liberal Democrats Steve Sollitt, Sarah Bain, Mark Balaam, as well as Conservatives Judith Grajewski, Jerry Hall, Margaret Atkinson, Daniel Hatfield and Elizabeth Lear. The abstaining councillors were the mayor, Maureen Sollitt, and Fair Oak’s Des Scott (both Liberal Democrats). All other councillors present voted for the motion. Attendance at the meeting can be found here. Separately, ADD received confirmation from the council yesterday that the timetable for the Local Plan on its website was now out of date and that the timings have been delayed again. Rather than starting a second public consultation in “the autumn”, the council expects to make a decision on the definitive ‘proposed submission’ by “mid December”, provided that it has received the necessary evidence by then, and start the second public consultation in “January / February 2017”. It hopes to submit its Local Plan to the Secretary of State in June 2018, after the local council elections the month before. EBC’s updated timetable is now correctly posted on its website. This new delay will in turn put back the date by which EBC can submit its draft Local Plan to Planning Inspector – leaving Eastleigh even longer without a Local Plan. Thank you again to the hundreds of local residents and the 20+ speakers, including from the Woodland Trust, the Campaign to Protect Rural England, the Angling Trust, the Test and Itchen Association, Stokewood Surgery, 4th Bishopstoke Brownies and 12th Eastleigh Scout Group, who opposed the “direction of travel” being taken by EBC for its emerging Local Plan. We are making a difference, and together with thousands of others who were unable to attend the meeting, we will continue our fight for Eastleigh’s Local Plan to be properly evidence based until the bitter end.